Evernote is an app many of us use more than any other, including Facebook. You can use Evernote for many different things but in this post, I’m going to show you how Evernote makes me look smart in an interview. Whether you’re interviewing someone or the one interviewed, being unprepared can be disastrous. Even when you’re uniquely qualified for the task and have your ducks in a row, there’s always that one question or comment you weren’t prepared to answer. Quick, what’s your favorite book? Who was the author? Okay, that was a softball. What was the last great blog post you read about content marketing and who wrote it? Sure, no one expects you to have all the answers but, wow, do they notice when you have some of the harder ones locked and loaded. Evernote’s wide range of formats and its powerful search ability make it the ideal tool for quick recall of those tiny little factoids many of us find hard to retain mentally. Real quick, there are two separate search features I use a lot. The first is the search bar at the top of the program, “Search all notes“. The second searches only within the note you’re currently on: Edit > Find and Replace > Find Within Note (Ctrl + F on Windows). Fair warning – if you’re a big reader like I am, this can become a massive project. I have no idea how much time I have invested in “My Book Library” note on Evernote. Just keeping it up to date is a challenge, to be honest. With that said, this has become one of the most helpful notes I have on Evernote. Not only for answering those “what have you read” questions but for recommending a book or making sure I’m not buying a book I already own. Seriously, I’ve done that more times than I care to admit. I’ve purchased a book for Kindle just to discover I have the physical book in my bookcase. What makes us look smarter than quoting someone famous for saying smart things? I find Google and the large “quote” websites a little overkill when looking for a particular quote I loved. Evernote is a great place to store those that you resonated with and would like sharing from time to time. As silly as it sounds, I can remember, several years ago, when I heard the term, “Thought leader“. Just the idea of becoming a Thought Leader blew me away. I wanted to keep that term in mind so much I kept it written on a sticky note stuck to my desk for a while. So, this one needs a lot of improvement, at least for me. The only reason I’m including it here is in case you have a better solution for recording and organizing the best posts and articles I’ve read on blogs into Evernote. I have a notebook in my Evernote called, “Just In Time Learning“. Within that notebook are saved notes with titles like Podcasting, Book Writing, Public Speaking, etc.. This is where I record the best of the best blog posts, videos, and podcasts related to that topic I anticipate eventually needing. This notebook worked so well I added new notebooks within that “Stack (a group of Evernote Notebooks) for blog posts that stand out as the best reads on different topics. 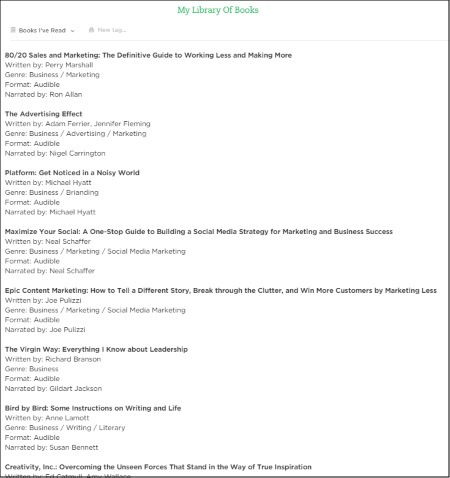 Before, while using Feedly, I used the share feature to send the bookmarks to Evernote. It would be awesome if I had a better way to make an Evernote notebook more “Feedly like“. There are a few IFTTT custom recipes that would simplify that by taking articles we make to read later and sending them to Evernote. The problem I see is that seems to require an upgrade to Feedly Pro. Personally, it’s just not worth $65/year to me. With that upgrade, though, it looks like you can send articles to Evernote without an IFTTT recipe. I’m not entirely sure. A recent Google search helped me find an old Life Hacker article, How to Automatically Archive Your Life with IFTTT and Evernote. I have no interest in backing up a bunch of useless data into Evernote, but I did find an excellent use for the idea. I use Google Calendar for just about everything, including event archives. For example, when did I first register my LLC? When was I interviewed and what were the details of each? 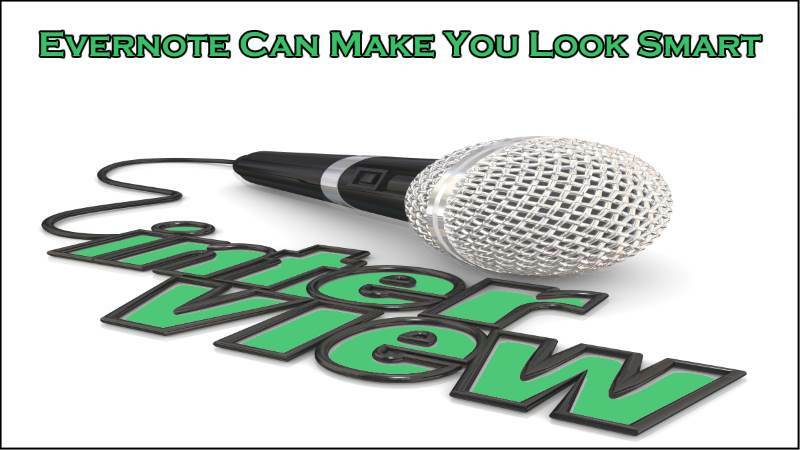 Now rather than saying, “I was interviewed by Mitch Mitchell a couple of years ago, like I would normally, I can say, “Mitch Michell interviewed me back in March of 2014” with a simple Evernote search. This tip can be a big one, especially if you’re like me and have a memory worse than an early 90’s 486 PC running Windows 3.0 (my first computer, by the way). Today I’ll be talking with Cliff Ravenscraft, also known as the Podcast Answerman. We’ll discuss starting a successful podcast. Hey, Cliff, why don’t you tell everyone a little about yourself and how you got started in podcasting? Today I have the privilege of discussing podcasting with the one and only “Podcast Answerman“, Cliff Ravenscraft. Cliff has been podcasting for over a decade, produced well over 3,000 podcasts, and has taught thousands of people how to start their podcast. Cliff Ravenscraft is a leader in the podcasting community and keynotes as a paid speaker around the World. Cliff lives in the Cincinnati area with his lovely wife, Stephanie, and their three children, Meagan, Matthew, and McKenna. Cliff is a self-proclaimed audio-snob and recently took health and weight loss to the next level with some serious priority changes. How do I know all of this? I never miss an episode of the Family From The Heart Podcast or The Cliff Ravenscraft Show, formally the Pursuing A Balanced Life podcast and the Podcast Answerman podcast (Rebranded to The Cliff Ravenscraft Show). Okay, as you can see, a few minutes of research and Evernote entries can make a noticeable difference in how smart we sound as an interviewer. There are many other uses for Evernote, before, during, and after our interviews, which are sure to make us look as smart as we are. Evernote can be the perfect tool for recording notes for your blog post or podcast show notes, for example. Rather than list everything under the Sun, I decided to keep things simple and let you come up with relevant ideas of your own. I hope you’ll share your ideas, thoughts, and questions in the comment section below. VIP List and enjoy true connection.